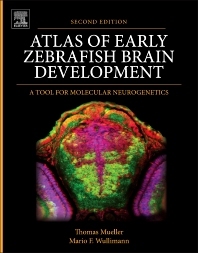 Atlas of Early Zebrafish Brain Development: A Tool for Molecular Neurogenetics, Second Edition, remains the only neuroanatomical expression atlas of important genetic and immunohistochemical markers of this vertebrate model system. It represents a key reference and interpretation matrix for analyzing expression domains of genes involved in Zebrafish brain development and neurogenesis, and serves as a continuing milestone in this research area. This updated volume provides in-situ hybridized and immunostained preparations of complete series of brain sections, revealing markers of the fundamental stages in the life history of neuronal cells in very high quality preparations and photographic plates. Specific additions to this edition include documentation on the distribution of neurons expressing GABA, dopamine and serotonin, material on the basal ganglia, hypothalamus, and the caudal, segmented part of the diencephalon, new theories on the early organization of the telencephalon and thalamus, and integration of a comparative perspective on the mid- and hindbrain.